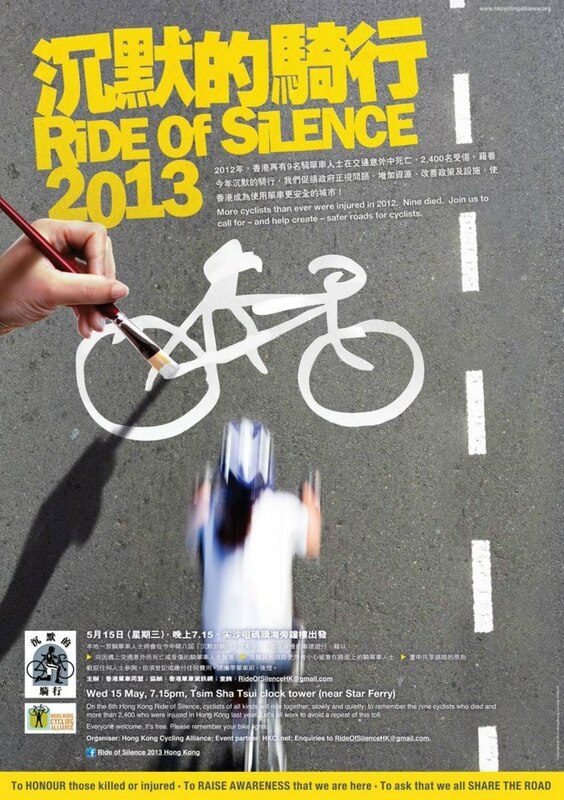 Another year has passed and so too have many cyclists in Hong Kong and around the world. We hope you can join this solemn event to remember all those cyclists who have been injured or killed while riding. 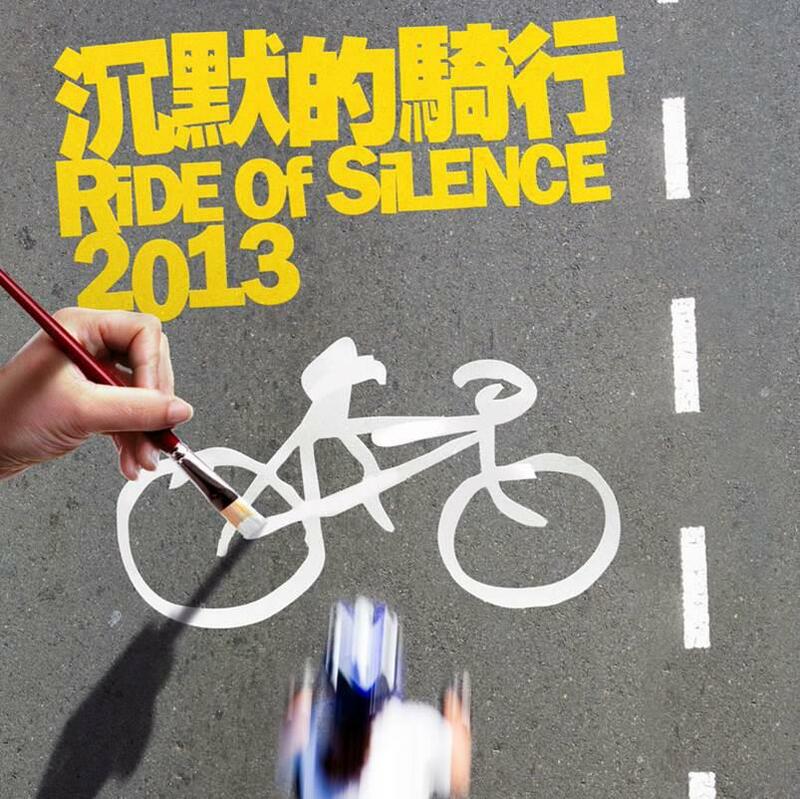 Riders wishing to join can meet at the Clock Tower on the TST promenade at 7:15pm on Wed, May 15 2013. After a glowing story in the April 2013 edition of Mountain Biking UK Hong Kongers can expect to see even more tourists arriving with mega oversized luggage ready to plunder the jewels of HK. But dont expect these new visitors to be pushing and shoving their way through the streets of TST or Causeway Bay. No way! They will be flooding ours santuaries - the MTB trails where we seek solace! Back in November, the HKMBA was contacted by Enrico Guala who manages the Life Cycle Team and organises many super enduro MTB races in Europe. He was planning to bring a pair of top enduro riders, Manuel Ducci and Valentina Macheda, and photojournalist, Matt Wragg. They would be here in few days to do a story featuring HK's MTB scene. Kenneth Lam, the HKMBA Vice Chairman, volunteered to guide them around HK and make them feel at home. Seeing as they would only be here for three days, Kenneth assumed that they would want to explore HK's most popular trails in Tai Lam CP, but instead they wanted to hit the tight single track of Lamma Island. The timing was perfect. The guys had just finished the annual clearing the trails of the thick vegetation that had grown like lightening over the summer. The massive typhoon had brought down a few big trees at the bottom of Snakes Tail and these too were cleared. Better yet, the giant golden orb spiders that spin webs cabable of felliing riders had retreated for the winter. Lamma's trails were ready for visitors. And what did they think of Lamma? ... Andrew and his friends have created one of the most amazing things I've ever experienced on a mountain bike --- an oasis of singletrack barely a stones throw from one of the busiest urban areas on our planet. A small, but perfect, santuary away from the chaos. Nothing is better than reading the story for yourself. 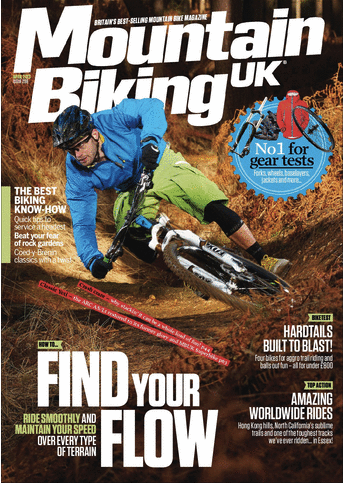 You can pick up a copy of Mountain Biking UK at some bike shops in HK or you can buy the magazine online via sites like Zinio. As you may know by now, the old Tai Mo Shan contour trail entrance, which is accessible off Route Twisk via a lump of concrete up onto a curb and behind a guardrail, will be phased out in favor of the new, flowy, 4-minute-downhill full of jumps and berms that starts at the top of the green ‘beginner loop’ near the official entrance. Nevertheless, a lot of people find this new trail a hassle when trying to cram in more shuttle runs in the morning [maybe we secretly enjoy sitting in a stinky van more than riding], and bemoan the loss of ‘the Big Rock,’ as it has affectionately become known over the years. For many of us, this entrance conjures up nostalgic memories of mist-filled mornings slipping and sliding down its root-strewn slopes, reveling in the dare and danger that has landed even the most skilled of us in the hospital with cracked ribs, broken fingers, ripped-off ears [full-face helmets came later], and worse. It has also become a poster-child for erosion and how ‘bad’ mountain biking is for trails, as a few vocal and angry hikers have said in their letters to AFCD and in the press. Every season it gets worse – the International Mountain Bike Association evaluated it as an ‘unmanaged risk’ with a ‘bad fall zone’ and is an ‘impalement hazard’ … fun stuff! If left as is, it will soon be nothing but a spider-web of slippery, exposed roots and thru-axle-deep ruts. And yes, it does cross over a hiking path at 90 degrees [the stone steps, right at the start], rather than run parallel as the new entrance does. However endearingly this treacherous start may have honed our skills and got our blood pumping in years past, though, there are now other fish in the sea – fresher, faster, more exciting to chase – and like an annoying partner whose wont stop nagging you about your ever expanding bike collection, its time to let 'er go and move on to somenice nicer. HKMBA is currently in talks with AFCD about creating more DH-specific tracks on this side of the mountain, without any additional uphill involved, and it looks positive - to the point where funding has been set aside and recon work is in progress. However, we need your help in developing the trust and mutual respect necessary to keep the ball rolling, and keeping public opinion on our side is part of that. Without public support, one rabid complaint in the press about shuttling will force AFCD to take a position against Downhill riding so that they can cover their asses in the event of a lawsuit. Years ago, a cyclist riding around High Island Reservoir in Sai Kung slipped on some gravel and tried to sue - now the entire area is closed to bikes. Not something we want to see happen. Most people in Hong Kong don’t understand cycling in general, mountain biking specifically, and undoubtedly find our Darth Vader-in-a-clownsuit attire while pinning it at 25 kph down Kap Lung the stuff of nightmares. As such, any good PR that we can generate is sorely, desperately needed – and supporting the closure of a badly-aligned, severely-eroded, and highly-visible trail is a huge step in the right direction. Of course, no trail is perfect – and in the final stages, IMBA and HKMBA have been listening to feedback from riders testing out the new entrance, particularly about the flow and positioning of jumps. As always, please do feel free to send feedback on this or any other trails to us at HKMBA and/or directly to AFCD, so we can improve what’s already there, and build even better trails in the future. *The track[s] at this ‘social’ entrance’ [that’s the Ag&Fish name for it] are as steep as 45 degrees in places, whereas the soil at this location has been evaluated by professional surveyors from IMBA to be able to sustain a maximum of 10-15% - not to mention it has the worst accident record in the entire park, and only lasts a few seconds. *This contour line trail is famous for multiple options and jump lines, and is HALF AS STEEP of a grade on average as the new entrance. The new Ho Pui trail head will be opened on Mar 17. Volunteers are invited to come and finish the last bit of trail and also plant trees! If you don't want to get dirt under your fingernails then come for the opening ceremony later in the day. 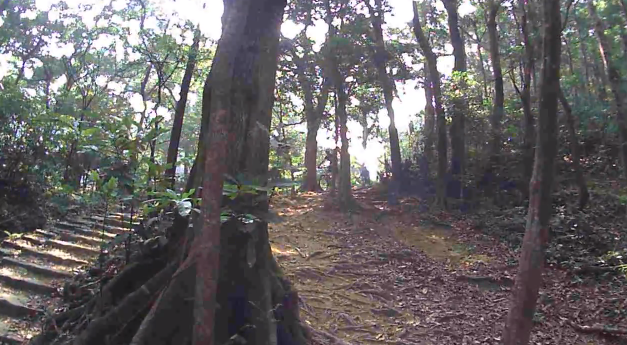 Most riders starting down the Ho Pui Trail have at some point had a moment a terror within those first 200m. Perhaps it had rained the night before and the track was as slippery as a bobsled run or maybe that coffee had not worked its way into your system yet and your reflexes were not primed for the ruts and roots only seconds into your ride... and it probably did not help that you were out celebrating into the wee hours the night before. Or maybe you are a novice rider entering Tai Lam CP for the first time. I think most of us will agree that this trail head badly needs some TLC. And it did not help matters that no one was using the legal trail head to begin with --- we have been accessing Ho Pui from Route Twisk illegally all these years! On Sunday Mar 17, The new Ho Pui Trailhead will be opened replacing the old (illegal) one. Those who have seen and sampled this new trail are already singing its praises. It adds distance and fun to Ho Pui while offering a far more welcoming experience to Hong Kong's most popular trail. The AFCD is inviting HKMBA members to put the final touches on the new trail head and help close off and kickstart off the rehabilitation of the old (illegal) entrance by planting trees on that eroded slope. The AFCD will be contacting participants from the Dec 2012 workshop directly but if you could not make it then, the HKMBA has 10 slots available for our members. Additionally, there will be the first of the volunteer trail maintenance days on April 7, where volunteers can help improve the lower sections of the Ho Pui trail (between the end of the downhill to the reservoir). More details about this will be available in the coming weeks as they become available to us. 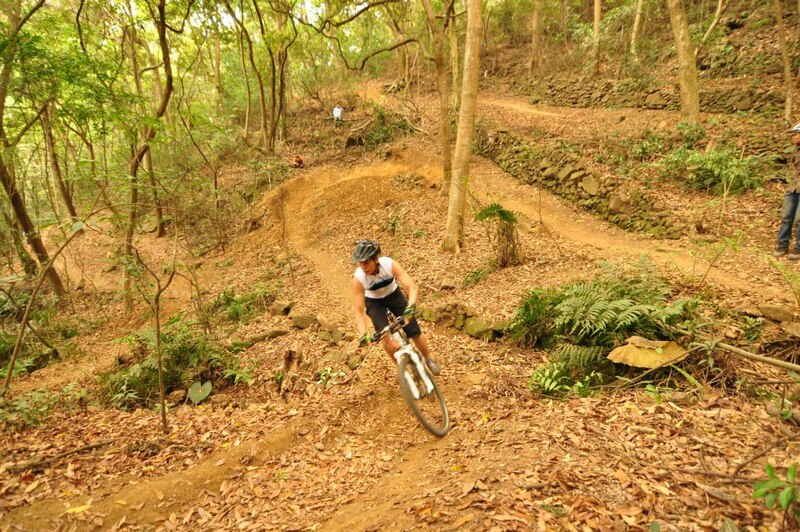 The HKMBA has always advocated for sustainable and safe trails for all levels of MTBers. And we have been pushing for changes to the old Ho Pui trail head for many years, even drafting our own proposal for a trail re-routing. This time the AFCD and IMBA Trail Solutions have gone well beyond our expectations by designing and constructing a first class entrance that should put smiles on most riders faces, except for the stubborn few who cringe at the thought of sweet, flowing trail under their wheels. Once this new trail is opened, we kindly ask all MTBers to respect the very valid reasons why the current, illegal trail head to Ho Pui is being closed and to use the new one instead. Note: In the event that the weather is very poor the trail building and opening ceremony will be held on April 7.
workshop but as usual feel free to contact the HKMBA if you have any questions and we will endeavour to get back to you ASAP. Venue: meet at Route Twisk Management Centre at 9:15am, then we shall depart to the work site after a short seminar. Food and Drinks: Pack your own lunch and beverages as none will be provided. Clothing:Weather conditions at this time of year can change quickly from bright, warm sunshine and 20C to cold, wet, and windy conditions. Bring footwear that is suitable for hiking and that you dont mind getting muddy or dirty. Also bring some work gloves if you have any. Public Transport to the Twisk Management Centre: Take KMB #51 from Tsuen Wan West Rail (or near Tsuen Wan MTR). Get off at the bus stop 26 "Country Park" at the top. The Twisk management centre is on the southern side of the road. The frequency of the bus is every 30 minutes or so. 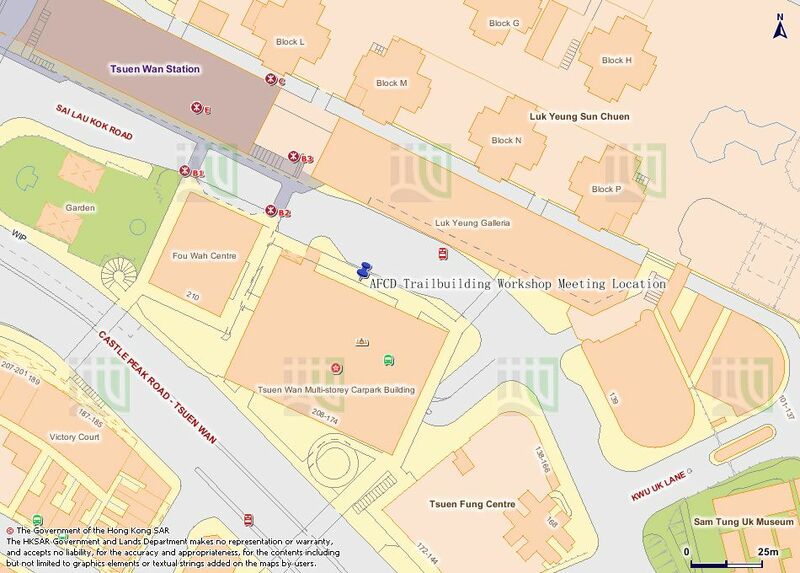 Here is the KMB route map: http://www.kmb.hk/en/services/search.html (plug in route 51). Get off at Stop 26 "Country Park"
If you cannot make your own way to the AFCD Route Twisk Management Centre, AFCD will supply a 24 seat coach to meet volunteers only at the Tsuen Wan. Look for the bus with the sign "AFCD Mountain Bike Trail-building Workshop" in the windscreen. No transport will be provided for those who bring their mountain bikes. Transportation within the country park will be provided by AFCD.